1. My six-year-old and I decided that having a cast should never get in the way of being fashionable. 2. I succeeded in an attempt at purposeful spinning. The yarn is what I had planned and envisioned, which is not always the case for me! Details: 2.9 ounces of Navajo-plyed Corriedale, from a Grafton Fibers batt, approximately 250 yards sportweight. There are scarf plans afoot. 3. My husband finally finished tiling our (only!) tub and shower, which was last seen on the blog looking like this. He did a beautiful job. 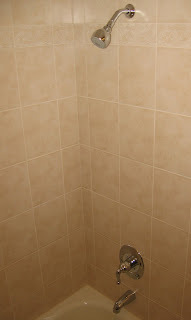 The second photo is a detail shot of the accent tile we chose.